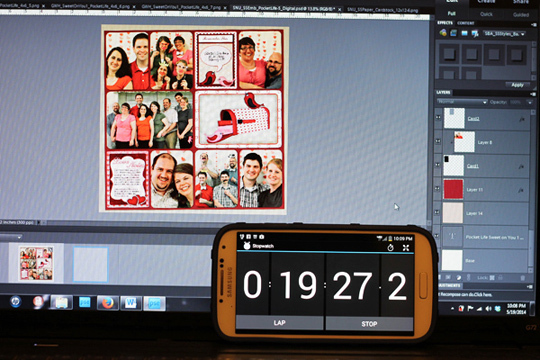 We all want to be able to make more layouts but finding the time to scrap can be challenging. 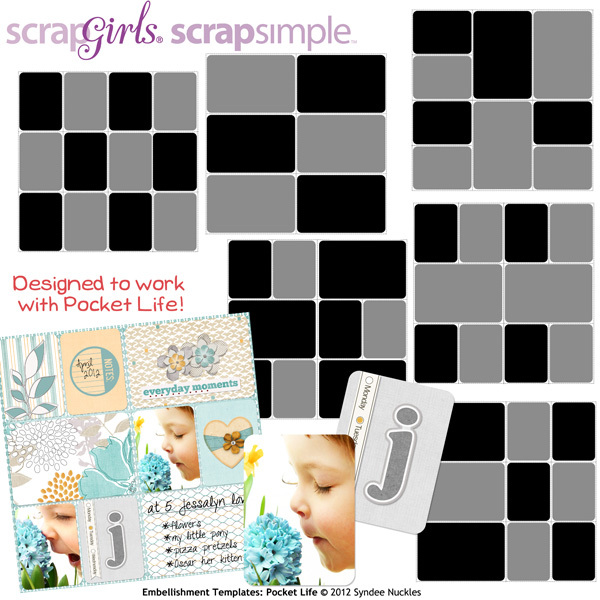 When I need to knock out a quick scrapbooking page I turn to Pocket Life journaling cards. 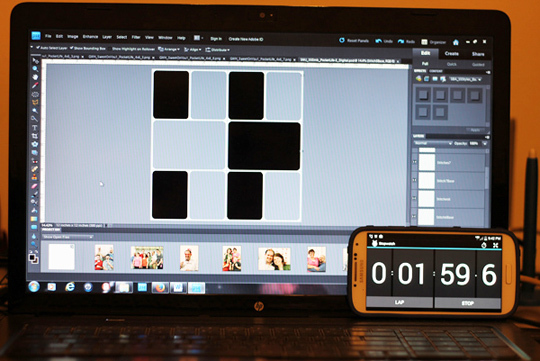 In this tutorial I’ll show you how I made a great layout using Pocket Life cards in under 20 minutes! Back when I started scrapbooking digitally, I only had two kids. And they napped every single afternoon. And went to bed by 7:00 p.m. every night. And I was all caught up with their scrapbooking. They each had completed baby books, and my family albums were up-to-date. Vacations got scrapped, and birthdays, haircuts, and playdates got documented. I was a scrapbooking rock-star! Then they got a little older. And busier. And I had two more kids. And bedtimes got later. And mornings got earlier. And naptimes got shorter. And all of the sudden, I’ve got a 16-month-old who has maybe three scrapbooking pages total. And I am overwhelmed. I don’t have time to obsess about each page for hours. But scrapbooking is still really important to me. And I still love the creative part of it. That’s why I was so excited to learn about the Pocket Life line of digital scrapbooking products. 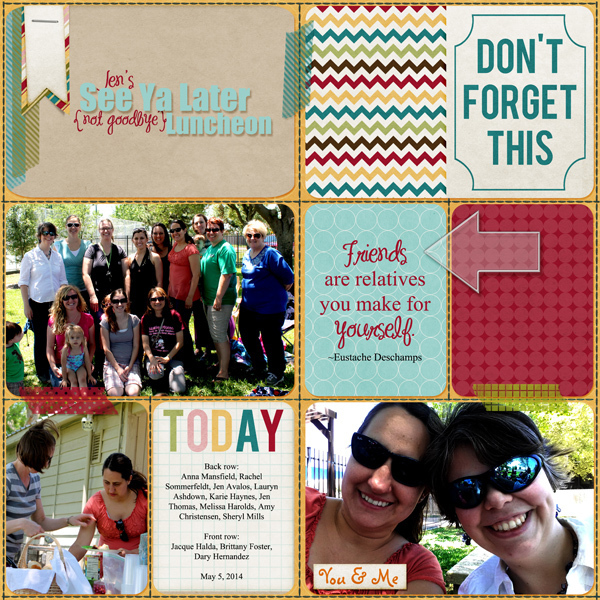 If you are not familiar with the Pocket Life line, here’s a quick summary: Pocket Life is a style of scrapbooking that works well with both your busy life (because, really, who isn’t busy these days?) and your desire to create beautiful, creative, custom scrapbooking pages for your family. 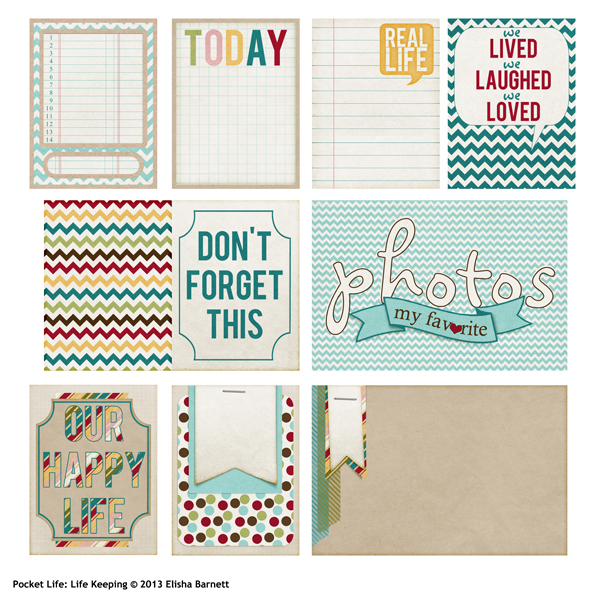 Pocket Life kits are designed to work with a grid-like style of scrapbooking, using 4x6-inch photos and premade journaling cards. 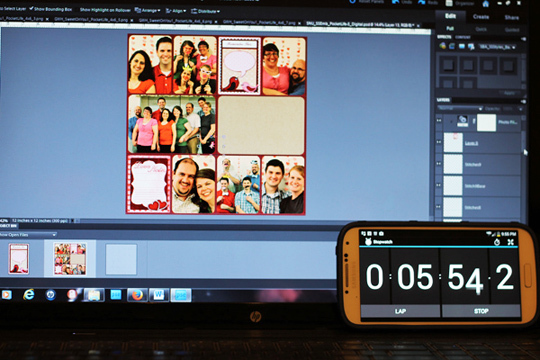 Place your photos on an 8.5x11-inch or 12x12-inch layout, add some of the decorative cards from a Pocket Life kit, add your journaling, and you’re done. Let me say that again: You’re done! Simple, efficient, and beautiful. Sounds great, don’t you think? Actually, I was a little skeptical when I started. I am a bit of a perfectionist, and I usually get frustrated using templates and sketches. I spend more time using them than I would if I just started from scratch. But the Pocket Life line was different. It was easy! The pieces all just fit together, without resizing or even really thinking about it. Don’t believe me? Let me prove it. I usually spend three or four hours on each scrapbook page. (That probably explains why I am so far behind in my albums!) 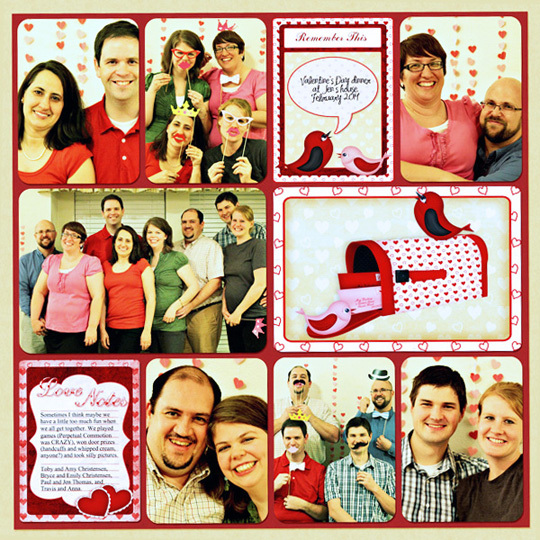 I created the following page using a Pocket Life kit and a couple pictures from a Valentine’s Day party. I have a timer that I used to keep track of my progress. First, I opened up all of the pictures and Pocket Life digital scrapbooking pieces I thought I might use in Photoshop Elements. Next, I placed them on my 12x12 page. I used clipping masks to make the pictures fit into the template, and I just deleted the template layers in the spots where I added Pocket Life cards. I also deleted the stitching layers that were part of the template. Finally, I added drop shadows and journaling. Start to finish, it took me just under 20 minutes. I was shocked when I saw how quickly my scrapbook page came together! I plan on using a lot more Pocket Life kits and catching up on my scrapbooking. If anyone needs me, I’ll be at my laptop, creating pages in record time! We asked a couple of our Creative Team members to share their favorite Pocket Life products with us! 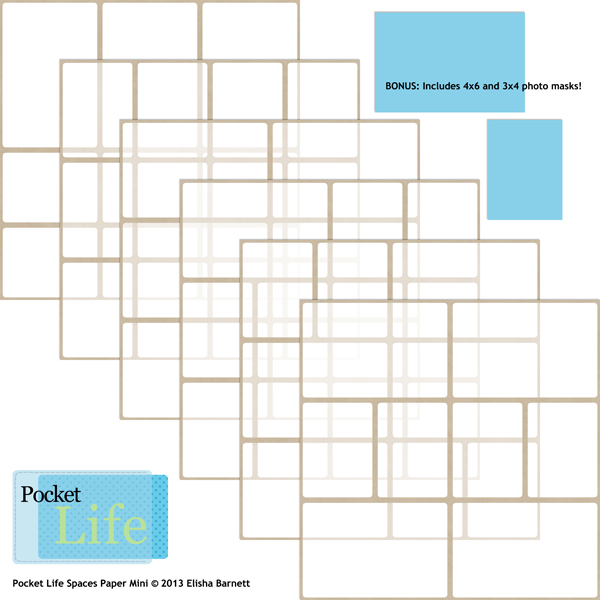 Melanie Cockshott: One of my favorite Pocket Life products is Elisha Barnett’s Pocket Life Spaces Paper Mini! The templates are super versatile, but what I really love about this product is that it came with 2 photo masks, a 4x6 and 3x5. By using the masks with my selected digital kit, I easily clip papers to it and add word art or embellishments and make my own matching Pocket Life cards. Andrea Rose-Hutton’s: I love Amamda’s Pocket Life Brush Set Weekdays. All Pocket Life collections just make your pages come together fast, and I love the colors and options available. 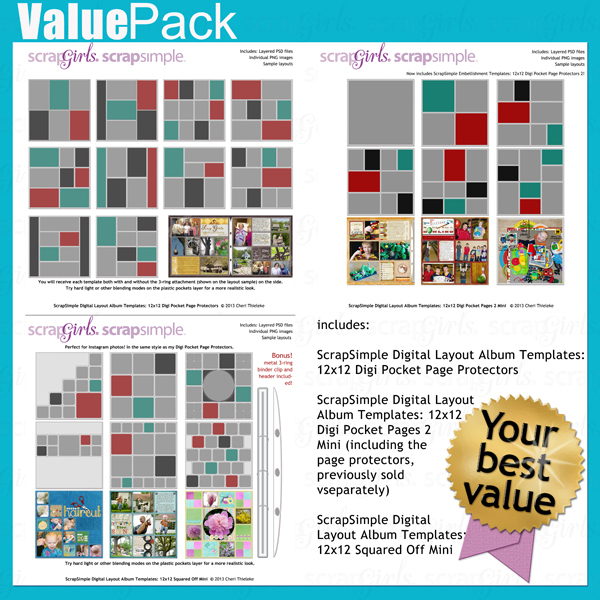 Monica Lebsack: For my Pocket Life layouts, Value Pack: Digi Pocket Page Protectors are a must have. The designer included templates that match many of the commercially available page protectors. 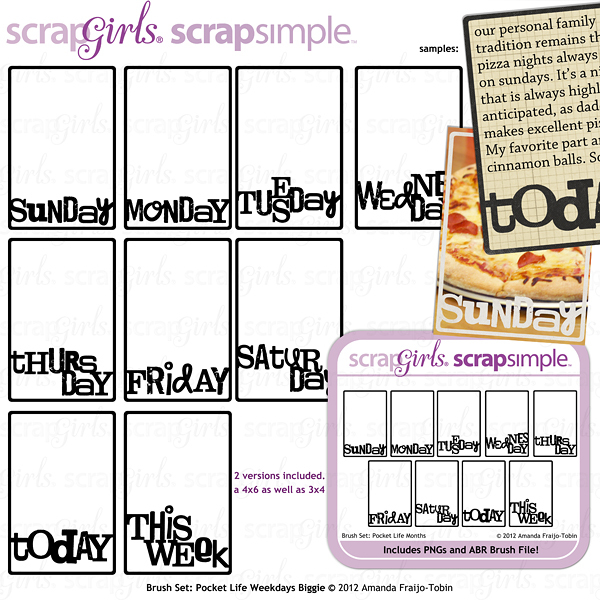 This means that I can arrange my pages to share on the Scrap Girls Forum and then print the individual cards at home.